We survived Day 2 of the SCG Open. After opening the broken double Kalitas yesterday today we had to play fair magic as our pool was not only short on value, but also in action. I played Green/White Allies again and my partner (roommate) played Red/Blue Control. Our best pulls (in terms of playablity) were Crush of Tentacles and Planar Outburst. Other than that we played very basic creatures. Our most interesting play was Ondu Rising into Crush of Tentacles to break a boardstall. However, our opponents rebuilt their board and the stall continued. The MVP was Valakut Envoker who started killing Ondu War Clerics (2) and Dimensional Infiltrator before they tossed an Isolation Zone to stop it. The Eldrazi player dropped an Eldrazi Devestator, but never attacked with it. Instead a new boardstall continued as they used Spawnbinder Mage to tap down one of our fliers. So what ended up happening was my roommate had 4 cards left in deck to the opponent’s 6 after the top 8 cards of his deck were eaten by the Infiltrator. We didn’t deck out, but also couldn’t win after going into time. Our opponents dropped Deceiver of Forms with a full board of tokens, but all of them got swept away with Planar Outburst Awakened. In the aftermath Valakut Envoker started to get more easy kills. I don’t recall much of the rest, but we won. Our opponents had the nuts aggro and eldrazi decks, also they hit us with double Dampening Pulse by turn 5. The Mardu player was very aggressive in the early game, but of course yield to the board stall as we desperately tried to make 0-5’s to block it. We were knocked down to 13 life pretty fast. Our Ondu War Cleric and Ondu Rising got us back to 26 before our eventual doom. We resolved Planar Outburst Awakened, but the Deepfathom Skulker drew the Eldrazi player a billion cards. We went into time, but died on turn 1. Our opponents tried to resolve Captain’s Claws, but my roommate’s killed every creature he tried to equip it to. Meanwhile our Stormchaser Mage came down turn 2 and stood unopposed for the entire match getting the beats every turn. Joraga Auxilary (who was killed on-sight round 1, and managed 1 activation before being killed round 3) was left unopposed to resolve her effect at will. I doubled Supported my roommate’s Stormchaser and Jwari Avenger allowing us to put them on a quick clock. They had a foil Bane of Bala Ged to attack with, but our opponent used up all of his mana filtering cards with Oracle of Dust until he didn’t have enough mana to cast an answer to our fliers. Thanks for reading as usual. (If you’re wondering about the ygo deck, it was $8 at the local Riteaid on the way home and I said “effect veiler is $5” let’s do this). So we just got back from the SCG Open. My roommate and I entered the 2HG sealed. We had the nuts pool of double Kalitas, Traitor of Ghet, which put in crazy work the 2 times he hit the field. I played Green/White Allies and my roommate played Blue/Black/Colorless Eldrazi. My rares were Stoneforge Masterwork (cut after round 1), Captain’s Claws, and Gladeheart Calvary. My roommate ran both copies of Kalitas. Due to a combination of work, stress and exhaustion this post may come off as snarky, sarcastic and short. For this I apologize. Because that’s all that happened. One of our opponent’s played Nettle Drone ping, while his partner held the ground with support boosted allies. We couldn’t do anything. As you might expect R/G was dead on arrival, mana-screwed after mulling to 5. I only saw 4 lands myself all game, but my roommate had Kalitas, which outgrinded the Eldrazi player by himself. We played a couple, which the husband was calling all the shots running a BW combat tricks. However, what stood out in this match-up was that the guy forgot the effect of Slaughter Drone twice allowing them to get blown out 2 times. So we went 2-2 and got 20 points each, which are being saved for tomorrow. Day was fun, but frustrating. We made good decks, but I got either flooded or mana-screwed every game. Kalitas is very strong. I had originally planned to play in a Force of Will ARG today, but a combination of minimal playtesting and fear of Reflect made us favor the Open. I did get all of the SKL rulers though. The road to getting all of the post-Valhalla J/Rulers continues. Wait! No! I can explain! So after getting the trial (starter/intro) deck and 1 box for this show I didn’t have enough cards to actually build a deck I wanted to play in this game. I got a great deal on a second box. After a somewhat awful afternoon thinking it got stolen (you can’t trust ebay taking apparently) I got to crack this open yesterday night. I give the same disclaimer as last time. These are the rares pulled from this box. The most relevant pulls with one Golden Darkness and one Sitting Lala, which not only were absent from the first box, but are needed for the set/show specific Resonance mechanic (essentially by revealing either card in your hand you enable various bizarre effects for characters in either Red or Yellow). These were the cards pulled in the 2nd box, but not the first. I don’t know why this was interesting enough for me to single out, but it was. Maybe Golden Dankness is a secret rare?! As even I have limits though. I can’t justify buying Golden Darkness (as she’s a $30 card for some totally not obvious reason). So instead I ordered a playset of the card that searches “Transformation” characters in yellow (along with other cheap cards) to hopefully fill the void of expensive archetype staples. Also I’m not sure what cutthroat Weiss meta I’m planning to enter, but it will probably work out all the same. I preface this post by saying I have the best roommate ever. As usual I threw it together half an hour before the event, but left it on my table when we left. My roommate was looking for a Machina, the Machine Lord for his Green Ramp Val 2.0 deck. When this fell through he loaned me the deck and played R/R Knights instead. I had seen Val 2.0 alot, but this was the first time I played it. I’d played against his build so I knew the game plan (Pricia God’s Art for 4). As a result of luck, tenacity and nonsense I almost got 1st place using his deck. Same guy, same struggle against a million discard spells. I flipped Valentina turn 4 with a Demon Sword out and ran him down game 1. I anticipated him siding into Blazer so I cut the Sacred Beasts for Valentina’s Zealots (Mistake). He stay as Dark Alice and managed to get both of our J/Rulers killed (attack my tapped Valentina with Dark Alice + Flame of Outer World). After that Nyalathotep beat me down for game. SOOO game 3 I should’ve lost. He sided into Blazer keeping Valentina off the table the whole game. I sided out Gwiber and added back into the 4 Sacred Beasts. He had 2 Dark Farias (+Gruebelesta) out gaining a ridiculous amount a life each turn. I sacrificed Blessed Holy Wolf + Adombrali to kill out, then outed the other with 2 Farmilars of Holy Wind. Then his Marybells started to threaten 20 damage a turn. I searched out my 2 Mary Bells and we entered into a huge chase (chain/stack) of Marybells killing each other. The score was 6 (me) vs his 80 when he went into time. It was his Dark Faria (+Gruebelesta and Little Red) vs my Gretel (useless), Chesire Cat and Bai Hu, the Light Sacred Beast. I J-activated Valentina to try to steal with Faria with Val 1.0’s God’s Art, but he Flamed her on the chase. I passed and Dark Faria killed the Cheshire, but not me. Thus, we drew. I’m undeservedly proud of drawing this match. My opponent (as he’s repeatedly shown) knew exactly what he was doing. I also made mistakes mostly with my sideboard. After a crazy long intense match I was suddenly playing against a new player. I approve of Crimson Girl totally so I respect his idea. I got the ideal set-up both games allowing for much uneeded styling though. We entered a long stall war due to his choosing not to attack. However, his Fairy Queen Alice was really big whereas my team while capable was not that big. The 19/21 Alice was blocked by my Gwiber, but the other flying fairies boosted by Heavenly Garden of Armala and Vivianne killed me dead. Yeah this was dumb. It was really dumb. Especially since his sideboard Deathscythe was in the deck I was using. Game 1 I got him to 1000, but couldn’t close out the game after Valentina died. Games 2 and 3 I resolved the Pricia God Art for 4 and won. I gave me the win afterwards. Val 2.0 is amazing, but very hard to play. You have a lot of decision trees to consider, which is really hard for a new player. That being said it’s a lot of fun to use all the God’s Arts and have multiple angles to attack the opponent. I’m definitely going to try her out before The Moonlit Savior comes out next month. Again thanks forever to my roommate for letting me borrow his deck. I went to Katsucon in Washington D.C. last weekend. I bought cards, quite a few cards (well not that many cards by my standards). 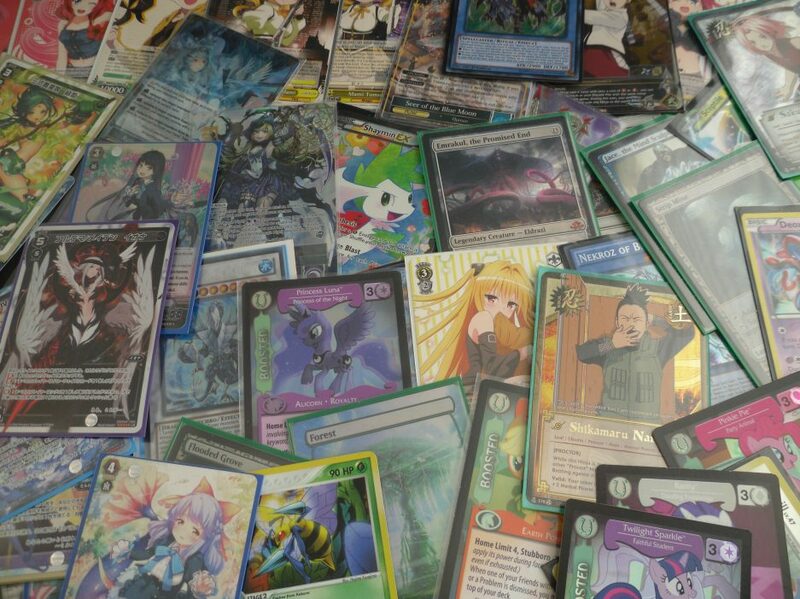 Anyway, here are pictures of my pulls presented for no real compelling reason. I opened 3 packs from the bottom of a Wing Raiders box. I resisted buying a box of this set, though I do like the staple cards reprinted in it. It’s a great set if you want to build Raid Raptors, Super Quantums or Phantom Knights. I do want to build Phantom Knights, but it’s a small side goal. So I’ve learned that the quarter Magic box is much better than the $1 rare box. I found a larger amount of cards that had no business in there (See Remand). However, I also thought Coiling Oracle was worth a $1 so that was a mistake on my part. I want to collect all of the post-Valhalla J/Rulers. These 2 were really cheap. I know this is a ridiculous and expensive goal, but it’s been driving me of late. I got all of these for $30. I’m honestly surprised I spent so little in the merchant’s hall (though that’s not a bad thing). I made a mistake not bringing my Vanguard deck in hindsight as many wayward people challenged me to it. It’s a thought for the next year’s convention. Anyway, this is a swag post. Nothing much else to say. I got just back from my Force of Will local tournament, taking first place with my very hastily thrown together Reflect/Refrain Mono-Red aggro deck. While the errata has very nicely balanced out Reflect, I assumed (incorrectly) that it would still be a highly represented deck in the field and that the pre-errata lists would be seen. I was totally wrong, but it didn’t turn out to matter luckily. After being savaged by this deck for weeks (pre-errata) I knew how to fight it (namely, which fairies to kill on sight). I kept his Flame and Wind Sprites off the board until I gamed him with Split Heaven and Earth. Game 2 I won by searching out Lancelot after my opponent made the bizzare play of not killing my onboard copy. I have to admit my win came from my opponent’s whiff on 5 separate flip the top card effects, but his deck was filled with non-fairy filler like Grand Cross and Rewriting Laws so his consistency was minuscule. This match-up was hell. My opponent fully understood both my deck and the match-up. From experience I knew I was dead to Robe of the Fire Rat post-board so I was really soul-crushed after losing game 1 to Dark Faria’s life gain combined with Dark Alice breaking my shins (Misplay of the day I played Change the World while my opponent had Marybell out and forgot to get the counter when he broke it…). Game 2 it became very clear my only way to win was by throwing as many Split Heaven and Earths at my opponent as possible. My opponent had Keen Sense to cancel my first Split, but caved to the second and third one (lucky topdeck there). Game 3 I got him to 20 life with 5 stones out. I cast Thunder on his end step to get him to 15. On my turn I fired off Split. He responded with Keen Sense, which I had Refrain cancel. He played another Keen Sense, but I untapped and cancelled the second one. He took 15 from Split and finally succumbed. My opponent fell behind on cards early on as I prioritized killing him resonators to hold down Tinkerbell. I finished the game by searching out 2 Lancelots on an open board after Refrain bounced his blocker. He focused on a cool combination of Ame-no-Habakiri, but it was very susceptible to Refrain’s unsummon effect/compulsory evacuation device effect. Game 2 I opened 3 Change the World, Rapid Decay and 1 Robe of the Fire Rat. I knew it would be a long game, but that I had an overwhelming advantage. He responded with 3 Artemis Bows’ though I answered by casting and searching copies of Garreth. It was a long grind, but 3 Garreths combined with 2 Robes (I drew into the second early on) sealed the deal pretty fast. My sidedeck was really non-optimal for this new “meta”. All of the Susanowos were useless with no dragons to be seen. I had no side for Dark Alice other than Split and the very underwhelming Deathscythe. I boarded in Sign against the Reflect Fairies, but never was in a position I needed it. Robe is very powerful though. Both from fighting against it and by winning with it, I can safely say it’s a power card in the format. I’m happy to have won, but I need to retool my deck. Certain cards like Pheonix (a meta call for Alice’s World) were dead in the new meta. That being said I’m very happy that the errata has possibly hosed the older R/R builds that largely took over the format. I got 3 copies of the Monarch structure deck. I tested the Monarch deck tonight at my local tournament. This deck is actually absurd. All of the awful hands I opened became playable after 1 turn. I played the mirror in the first round. It was a fun back and forth game 1, but I had the advantage in damage. He had Dominion out before me so he had his monarchs out first (especially after a turn 1 Erebus). However, I recovered and bested him by turbo-ing out Ehther. Game 2 I went turn 1 Light and Darkness Dragon. My opponent played 4 spells to reduce its attack to 800 and crashed with his Eidos. I proceeded to summon Erebus and crush him. Game 1 I summoned Cauis the Mega Monarch banishing all of my opponent’s Graphas. Game 2 Erebus sniped the relevant cards from his hand so he gave me Lava Golem. I won with said Lava Golem and Majesty’s Fiend after Stormforthing his last guy. I went turn 1 Erebus to take a card from his hand backed by Dominion. He pendulum summoned out some blockers. I had a 2nd Edea though so I went for a second Erebus wrecking his scale. The next turn I took his last card away with Mega Cauis. Game 2 he pendulum summoned Majespecter Kirin and Nova Dragon Magician in defense. I ripped a Twin Twister to torch his scales. After which I summoned Edea and summoned Eidos. Then I played Stormforth prompting Kirin’s bounce on Eidos. However, I still tributed for Erebus sniping his Kirin and then winning the game shortly after. This deck is insane. It makes advantage by just summoning your big monsters. Also while I was never happy with my opening hands I could always make plays by the second turn (thanks to either Edea or The Prime Monarch). My MVPs were Ehther (as it cheated out massive damage and set up the 2nd best card) and The Prime Monarch (which I took great pleasure in summoning in attack mode to get the beats). I’m not sure I want this. On the one hand I think the deck is fun to play, but it inherently makes my opponents not be able to play. I think if I take out Dominion so I can play Xyzs it might be alot more interactive, but also significantly weaker. That being said I really just don’t want to have a meta ygo deck when I’ve come to realize I love this game as a casual player (scum confirmed). So yeah Monarchs are real. Have a side for them. I want to sell this and go back to goofing, but this deck is alot more consistent than Infernoids (another deck I should sell, but probably won’t). Whelp thanks for reading as always.